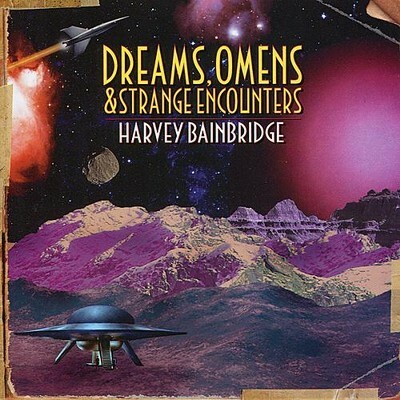 Harvey Bainbridge - "Dreams, Omens & Strange Encounters"
For anyone studying Spacerock 101, the name of Harvey Bainbridge will be forever linked with Hawkwind, where his bass and keyboard sounds helped co-pilot the Hawk mothership through their turbulent 1980's period. Although their glory days were well behind them, they continued to put out a series of excellent, if not quite classic, albums, most of which have been sadly unavailable for decades. All that started to change in 2008, when Esoteric Recordings (part of the Cherry Red Records Group) acquired the rights to over twenty years' worth of Hawkwind recordings, from 1976 to 1997. As if that were not enough, the Esoteric deal appears to have provided impetus for a new album by Harvey, apparently recorded live in the studio, on which he plays all the instruments. These consist of a range of vintage keyboards (including Moog, Casio, Yamaha and Roland), with not a guitar, bass or vocal mic in sight. "Dreams, Omens & Strange Encounters" consists of four long (and one very short) instrumental synthesizer excursions, spread across 68 minutes. The opening track, "Fatima's Hand", is a twelve minute techno journey through the Middle-East, and would not have sounded out of place on Hawkwind's "It Is The Business Of The Future To Be Dangerous" (ironically, a post Harvey album). "Nemesis" stretches things out still further, and heads straight for outer space with initially-beatless ambient synth washes calling to mind the early days of Tangerine Dream. Electronic drums loops kick in at about the seven minute mark, gradually coming to the fore, and propelling the music on a journey not dissimilar to Kraftwerk's "Trans-Europe Express". Next up, and just 99 seconds in length, "The Scanning" contains vocal and looped synthesizer samples from Hawkwind's "The Scan" and "Void City" (both originally Bainbridge/Brock co-writes, the latter itself taken from the '60's TV show "The Outer Limits") and provides the sole vocal spot on "Strange Encounters". This then fades into the double-titled "Zone Of Avoidance/The Voyage", home of more synthesizer improvisations which receive a "Dream Worker" - style kick start at around seven minutes. The album closes with the lengthy "Unravelled in Rye", the sonic textures of which bring to mind sunlight refracted through sea water, gentle and atmospheric, rather than dark and gothic, and propelled by handclap-and-heatbeat percussion. Not a rock, drone or techno album, "Dreams, Omens & Strange Encounters" is grounded in the classic electronic music of the 1970's played on vintage instruments, channelled through mid-period Hawkwind, and arriving in the 21st Centuary. While Harvey's myspace page photos show that his appearance has not aged at all well (formerly frizzy-haired Brian May clone, now grey and baggy-eyed Doc Brown figure with unhealthy-looking teeth), the album indicates that his musical horizons are not only undiminshed but are perhaps even entering a new level of sublime creativity.